Stylish, new Tween Chaise with two pillows features a mixed hardwood frame that is generously padded with polyurethane foam padding for comfort. This chaise has a gently curved backrest along the long side of the chaise, as well as a matching shorter one that would be used to lean against if you are using it to lean against when reclining lengthwise on the chaise surface. It also features two 16" square pillows for added comfort and appeal. The inner backrest and seat surface are upholstered in the new Wildflower all-over multi-colored floral pattern with a pink background and assorted sized and shaped flowers in white, Passion Pink, light blue and navy. 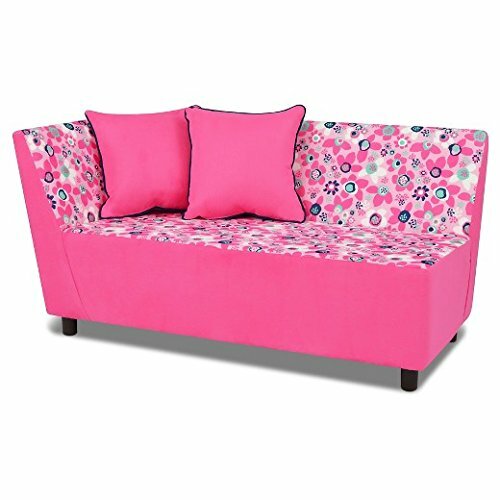 The remainder of the chaise is upholstered with the solid Passion Pink polyester microfiber. The pillows are filled with densified fibers and are covered with the solid Passion Pink. There is a coordinating navy welt cord trim surrounding the outer edges for added appeal. Bottom is sewn closed. The bottom of the chaise is covered with black poly/cotton upholstery fabric and there are round plastic feet that attach to the bottom corners by twisting tight into the pre-drilled holes on the bottom corners. Perfect for use as additional seating, a chaise for lounging, or this chaise may also be used with the #3250-02-WFNVPP Chair, Pillow and Ottoman set in the matching fabric to create a corner sectional unit, or longer bench seating along a wall with the ottoman in front! !.